"Women should be at the heart of planning maternity services." Midwives know from lived experience the value midwifery care has for birthing families, their communities, and the world. Next week, the evidence base for the impact of midwifery care will be significantly expanded. At the recent International Confederation of Midwives meeting in Prague, upcoming publication of the Lancet Special Series on Midwifery was announced. What is this research about and why is this release so important? The Lancet, considered to be one of the world's leading medical journals, is devoting an entire series to bringing together all of the available information about midwifery care in one place. It comes at a critical time when policy crafters are making decisions in the U.S. and worldwide about how to fill the growing gaps in the maternal health care system. According to the series coordinator, Petra ten Hoope-Bender, the series will include six papers (read her full description of each paper here). According to the Healthy Newborn Network, the series will "Go a long way to helping make the case that investment in midwifery is a highly effective way of improving a nation's health, as well as just the right thing to do from a woman's perspective." The series will also be multidisciplinary: ". . . It unites midwives with statisticians, epidemiologists, economists, and other disciplines," according to the Maternal Health Task Force. The rollout will run Monday June 23rd through September and will be free and available online at the Lancet. 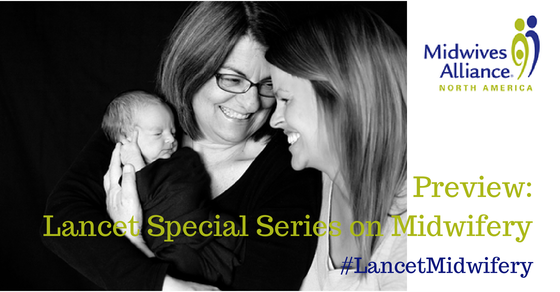 Watch here and on Facebook and Twitter for updates, and be sure to join the conversation at #LancetMidwifery. I cant wait to get a look at this long-awaited series in the Lancet. Getting clear information about birth and health is so important when we make decisions that impact our families. Expanding women's options for safe, high quality, high value maternity care should be a top priority. The health and well-being of our moms and newborns, families and communities is what is at stake and midwives answer the need for care that supports normal physiologic birth, bonding, breastfeeding and life-long healthy habits. I have some confusions regarding the service of a midwife. I doubt about it and I do not simply trust on it. Hmm they really help with the taking care of babies. These midwives are really essential specially for the new born babies.